Home security camera system? Not for me. Yes, there’s been the odd break-in on our street, but who wants to add a whole new wiring system throughout the house, with ugly cameras ruining the decor, to say nothing of the cost. And don’t you have to pay some sort of annual subscription? Actually, no, you don’t. You can completely forget about the wires too. And those ugly security cameras have shrunk to discreet white boxes smaller than a pocket radio, using standard batteries that last a couple of years. Starting price with a single camera, around £130. Extra cameras for about £100 each. With Blink that’s all you pay. No hidden costs. THE SET-UP I’M REVIEWING HERE comes with two cameras and a central Sync Module. Each camera takes a pair of AA batteries and, once linked into your LAN wirelessly with the help of the Sync Module, needs no cables either for power or data. 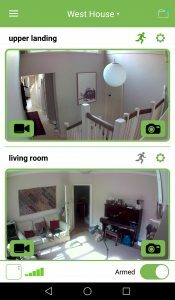 Provided the cameras don’t stray too far from the Sync Module or your wireless access point you can put them anywhere around the house. Outside the house is more problematic, as this version of the Blink camera isn’t weatherproof. Under the front door porch would work; out in the garden, probably not. The Blink camera has eyes and ears, recording 720p MP4 files that include remarkably clear mono audio. Data is saved to the Blink Cloud service and displayed on your Android or iOS phone. 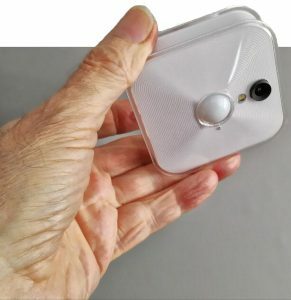 Recordings are triggered by the device’s own motion sensor, which has adjustable sensitivity, the maximum covering a distance of about 30 feet. The 110º lens has a wide field of vision, helped out in the dark by a bright white LED (more on that below). Setting Up (So easy, I almost forgot to mention it). The Sync Module connects to the cameras and your LAN wirelessly. There’s also an Ethernet port and a USB socket, both non-functional for now, awaiting future development. The two cameras need to be hooked into your LAN by connecting to a wireless access point. They also have to connect wirelessly directly to the Sync Module. The Sync Module is a small white plastic device, half an inch high and around 2 inches square. It comes with a microUSB cable and power supply (actually, you can use any microUSB phone charger you have lying around). Each camera comes with a small plastic mounting bracket. Its limited articulation might make it hard to get the camera pointing where you want it. Blink has a page of instructions here. Install the two pairs of supplied AA batteries in the cameras, download the Blink app onto your phone and run its Setup Wizard. 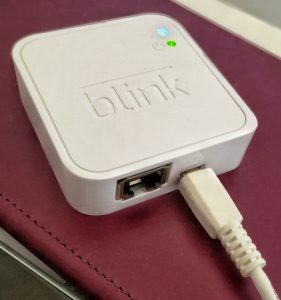 You’ll be asked to sign in to the free Blink cloud service and tell the Sync Module the password for your access point. You’ll also need to type in the serial number of each of the cameras you’re using so the Sync module can find them. That’s it. The cameras go live and put up their pictures in the app on your phone. When Live View is active, a second, blue, LED lights up. This blue warning light also goes on during any motion-triggered recording. Blink calls this “Privacy assurance”, emphasising that it’s “non-hackable” and “hardware-based… so you’ll never be caught off guard.” The intention, I suppose, is to ensure the camera isn’t used as a surreptitious spying device. But as it’s so small and easily concealable, anyone who wanted to use it for this purpose would only have to tape over the blue LED. The remote controlling app also has a feature called Live View, which switches on the video camera without making a recording, allowing you to watch and listen in real time on your phone. Alternatively, you can also put up a still picture of the remote scene on your phone. The still image and the Live View are particularly useful when you’re first positioning the camera, allowing you to check the field of view on your phone. However, neither the still image or the moving image can be saved to storage. Only videos triggered by motion are stored. They go straight up to Blink’s own Cloud storage, and the app views them from there. Because of this, there’s a lag of several seconds between the live event and the video appearing on the screen of your phone. The camera system is controlled through a free phone app, available for iOS and Android (I’ve only tested the Android version). Its very clean Material design opens with the last recalled view from two of your cameras; if you have more cameras they’ll show up when you scroll down. In this screen you can touch either of the icons at the bottom of each picture, the video camera icon on the left or the still camera icon on the right, to activate either Live View or a snapshot. There are two icons at the top right of each camera frame, a running figure and a cogwheel. The cogwheel takes you into the camera’s individual settings, where you can enable or disable motion detection, adjust its sensitivity and retrigger time (how long the motion sensor remains inactive after each triggering) as well as the length of each clip, up to 60 seconds. This is also where you’ll find the settings for the illuminating LED (see Pros and Cons, below). Scrolling down to the bottom of this screen reveals the ambient temperature around the camera. Here, as well as a battery indicator, you’ll also be able to get a read out of the wireless signal strength between the camera, its access point and the central Sync Module. In case you’re wondering about that running figure icon, it’s just a quick link into the camera’s motion sensor toggle in settings. You can arrange for the app to put up a notification whenever a camera is triggered, either popping up as a screen overlay or just as an item in the notifications pull-down. Optionally the notification can sound off whatever standard system alert tone you’ve set. I found myself wishing that Blink could have its own individual alert tone, to make it easily distinguishable from an email or a tweet, but I could find no way to do this. Ideally, of course, in a multi-camera system it would be very useful to have a separate alert tone for each camera. Perhaps this is something Blink might be planning for the future. Naturally this economical set-up has trade-offs. Chief among them—no PTZ. The initials stand for Pan, Tilt and Zoom, physical movements of the camera and lens that require actuators. Actuators eat juice and juice means wires. The wide angle of the lens somewhat compensates for the lack of PTZ. A higher resolution would have been a more complete antidote to the absence of zoom. While 720p is fine for inspecting the whole picture, it’s not optimal for expanding detail. As you can see in the picture, where I’ve blown up a section of a captured still of the mysterious intruder (hint: it’s me). The system offers simple scheduling of the triggering of the cameras. In an office, for example, you don’t want them firing every time Alice gets up to use the photocopier. And you don’t want to have to remember to set the trigger mechanism every time you close down the shutters at night. So you can set up simple on-off time slots for this on the assumption of regular office hours. At home, things are likely to be less well regimented. As the whole set-up is controlled from phones, and phones have GSM—more useful than clockwork scheduling would be automation of the triggering whenever all the family members have left the house. 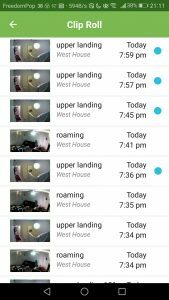 Many alarm and other home automation systems work on “presence sensing” and “geofencing” like this. But not Blink. Some users may have preferred an alarm mechanism. On this point I find myself agreeing with Don Shulsinger, Blink’s VP of sales and marketing. 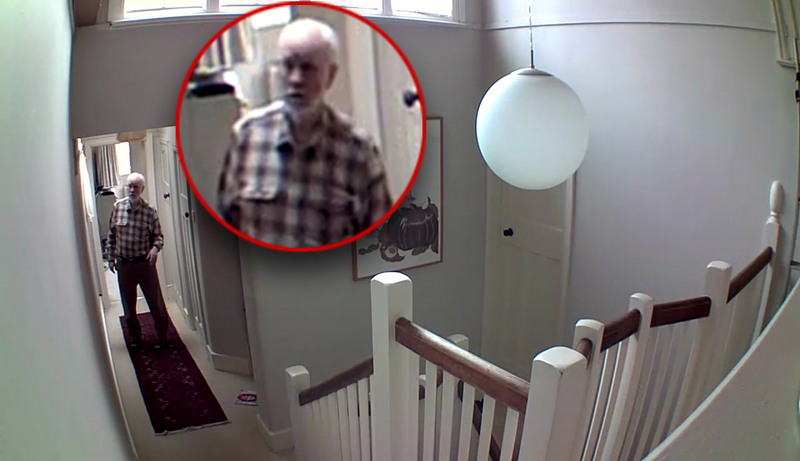 Any “alarm” sound from a device as physically small as the Blink camera is hardly likely to scare off a burglar. With its eyes and ears, Blink seems to be designed as an unobtrusive reporting system, not a guard dog at the gates. The arrangement for low light viewing does seem to run contrary to this idea, though. Infra-red illumination would have been an ideal, if more costly, alternative. Instead, the Blink camera uses a very bright LED, the visual equivalent of an ear-splitting alarm. The app does give you full control over this. The settings page for each individual camera lets you decide whether or not it will fire, always or automatically when required, and gives a choice of three levels of light intensity. On-the-fly stills or video clips you grab by hitting the relevant camera button on your phone don’t get saved anywhere. Motion-triggered clips are momentarily stored inside the camera and then streamed up to Blink’s Cloud. The Cloud will store up to 7,200 seconds of video. On reaching this limit it makes space by deleting the oldest records. The phone app retains an updated list of these clips, tagged with date, time, camera name, a thumbnail still shot and—for clips not yet viewed—a blue dot. Touch any item on this list to play the clip. A sharing symbol below the play bar lets you pass the clip into a variety of other apps, Twitter, GMail or Google Photos, for example. You can mark and delete clips in batches, but if there’s a way to back up a batch of clips from the Blink Cloud to, say, your local Network Attached Storage, I couldn’t find it. You can, of course, transfer individual clips to wherever you like. But if you want to keep your own local historical record of comings and goings, batch transfer to backup really would be useful. This question of where the clips are held is, I must confess, something that troubles me about Blink—and many similar systems from much larger companies. Personally I’d much prefer the data never left the premises ✱. Yes, I understand the argument: if you record a video of the break in on your local PC or network attached storage, what are you left with when the thief’s stripped out all your IT hardware? Blink potentially provides an answer to that conundrum. I mentioned in the box above that the Sync Module is equipped with a—currently idle—USB socket. Blink tells me that storing clips locally in a USB drive may be a future enhancement. This would be a perfect solution, as the Sync Module is small enough to conceal anywhere within range of the cameras. As it’s wireless, you could make it very hard for even the most determined burglar to find. Yes, I’m actually sold (or would be—Blink is very kindly leaving the kit with Tested Technology). The price and philosophy (Cloud issues apart) of this very flexible home/small business surveillance system seem to me mostly spot on. I like the idea that you can start small and cheaply and easily expand the system, with up to ten cameras per Sync Module. But you’ll have to stay within Blink’s own ecosystem, by the looks of it. There’s no integration with, for example, Google assistant or HomeKit. Blink does work with the IFTTT phone app, but only if you happen to live in the United States. You can also “Ask Alexa to arm my home system”, but again this is only available in the US. In the States, users can upgrade to a paid subscription service. That’s not available here in the UK yet. One caveat struck me when I was reading the Blink Ts&Cs. Free Accounts may not have all the features of Paid Accounts and we may introduce limitations and/or remove features from Free Accounts without notice. It’s a standard bit of legalese, but it would seem at least to give Blink the opportunity effectively to withdraw the free Cloud service entirely, making your setup useless unless you stomp up for a subscription.